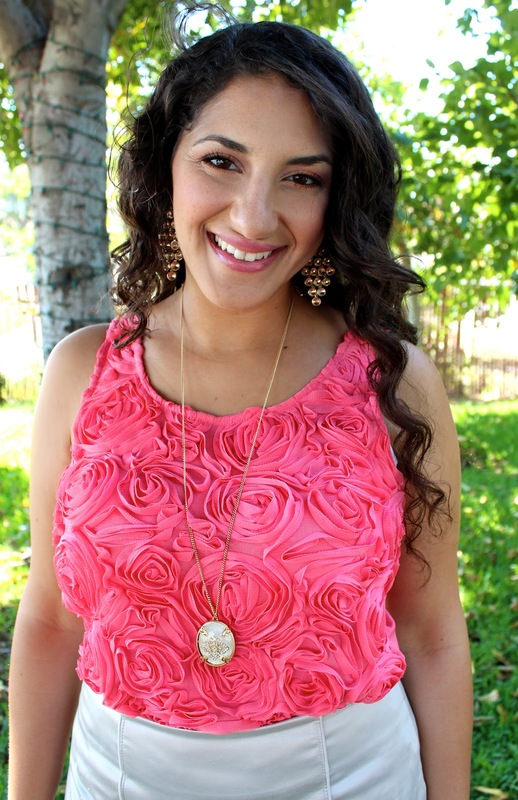 My outfit for Church this Sunday centers around this feminine coral blouse with rose detailing that I adore! I recently picked up this gorgeous coral blouse at Forever 21 and decided to pair it with a silvery taupe, satin pencil skirt that I also got from Forever 21 a while back. 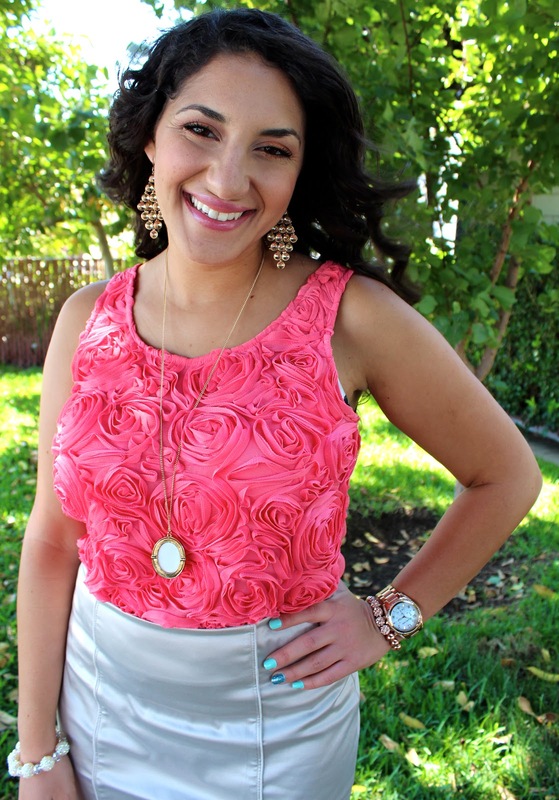 I think the neutral, light metallic skirt really pulled all the coral in this outfit together. The blouse is sleeveless and only has the rose detailing on the front. I got it in a smaller size than I usually wear because I was planning to tuck it into skirts and wanted it to be more fitted for this reason. I think the conservative length of the skirt compliments the sleeveless design of the blouse really well. 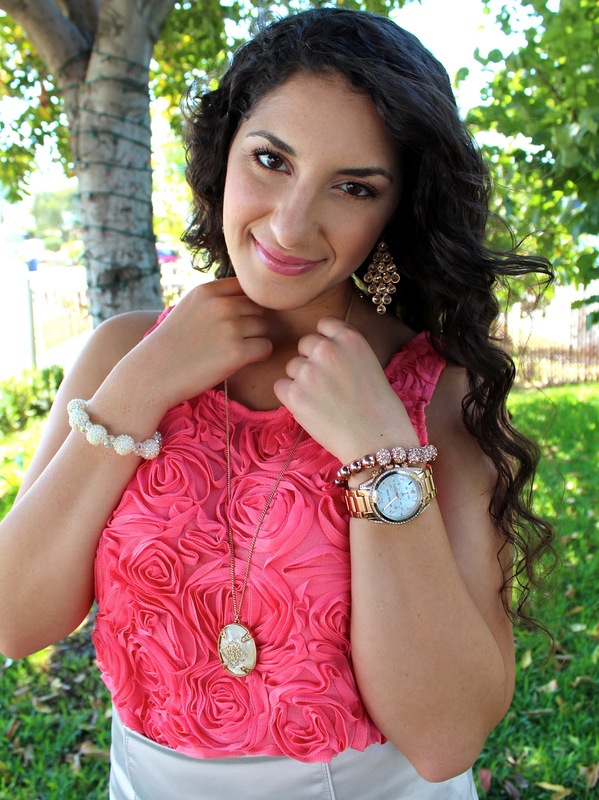 For accessories, I'm wearing my usual rose gold Michael Kors watch and rose gold Wrap Bracelet from Bauble Bar. I am also wearing gold chandelier earrings and a cream colored, round pendant with a cross design in the middle, both from Forever 21. The shimmery white rounded bracelet is from a jewelry vendor that set up a booth at my university a while back. The coral, almond-toe pumps are the Guadalupe style from Just Fab in the color Salmon. I love the side-buckles on these! For makeup, I did an orange and pink eye look to compliment the coral tones in the outfit. Maybelline Color Tattoo cream eyeshadow in Fierce and Tangy as eyelid base. MAC Call Me Bubbles quad: Fresh Daily (soft orange) all over lid, Full of Flavour (pinky-coral) blended into crease and tapered out, Call Me Bubbles (sheer white) as highlight and on inner corners. Also used a matte light brown to add a little more depth in the crease. Also wearing black pencil liner on upper and lower waterlines and L'oreal Voluminous mascara in Black Noir. Hope you're having an amazing start to your week!